Believe it or not, although I could be shot by some wedding planners for saying this – table centerpieces are not necessary! Modern wedding planning and the way that certain people have developed a keen sense for how to make even more money out of the wedding business over the past 30 or so years has duped us all into thinking a wedding breakfast isn’t a wedding breakfast without table centerpieces. centerpieces aren’t even limited to weddings with traditional sit down meals any more, relaxed garden parties with hot or cold buffets also make use of table centerpieces. Due to this, although you may be aware that they are not necessary, you, like myself, may think that they are something you would quite like to have due to them being part of the modern wedding vibe. The traditional flower centre pieces can cost anything from £20 each upwards. The flower hire company provide their prices online, however, in my experience many florists prices are a lot higher, depending on how big the arrangements are, what type of arrangement you go for and what flowers you wish to have. A personal favourite of mine is jam jar wedding centerpieces. Putting flowers in jam jars is a very effective and cheap way to create table centre pieces for yourself. All you need to do is collect some jam jars, even ordinary food tins, once they are empty, clean them out and decorate them with your chosen decoration, anything from rustic string, to pretty ribbon, gem stones, buttons, card and lace. Decorating food tins for wedding flower arrangements. You could even tie charms or table numbers around the neck of the jar with ribbon or string. Have them over spilling with flowers or just pop a jew in each jar. The great thing about using jam jars to display your flowers for wedding table centre pieces is that the look suits garden flowers perfectly. Does your Nan, Aunt or Mum have a nice garden? Ask them if they can grow some flowers in your wedding colours that you can then cut to put in your jars. 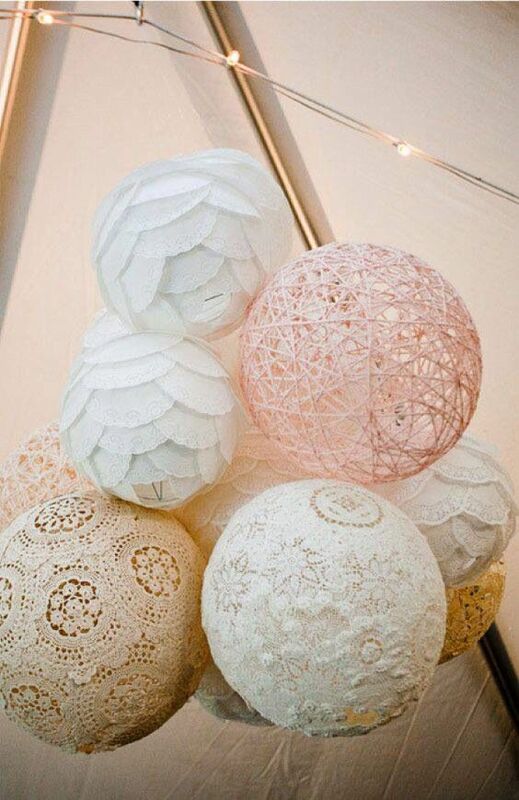 Use paper doilies to glue on to balloons, then pop the balloons and hang the doilie balloons around your venue for a chic budget way to decorate. 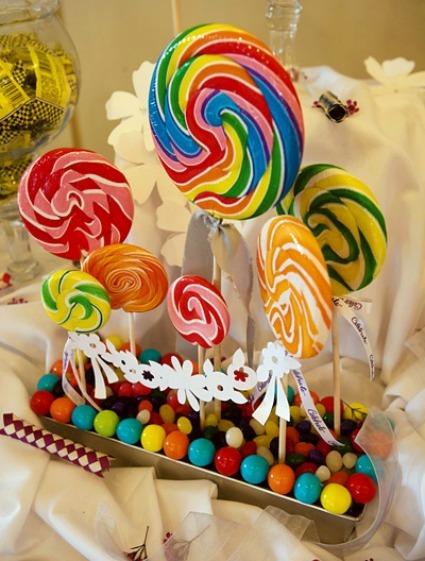 One of my favourite ways to create budget friendly table centrepieces, is to combine the wedding favours and the centrepieces; and what better way to do this than with sweets! 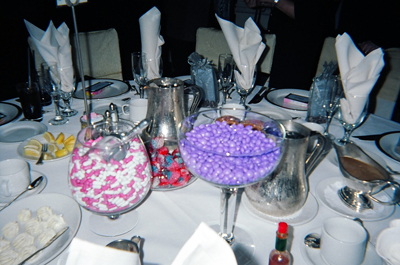 Many brides are opting to include a sweetie buffet in their wedding, so why not make the sweets the guests favours and put them on the tables as centerpieces instread of a random table at the side of the room. Combining three things in one – perfect way to save money. Having the sweets as centrepieces gets your guests mingling, especially if you have different sweets on different tables, as they grab the sweet bags/gift boxes and go to get some sweets they’ve seen on the other tables and will create a wonderful, relaxed after dinner atmosphere before the evening celebrations begin. If you are having an autumn or winter wedding A great money saving table centrepiece idea that looks really effective and stylish it to put either acorns, conkers, pinecones etc or Christmas baubles and a few decorations such as candles around the outside.